Topic: Resources of the Bighorn Basin : Wyoming Geological Association, forty-seventh guidebook, 1996. Bowen, Charles E. [Casper, Wyoming] : Wyoming Geological Association, [1996? 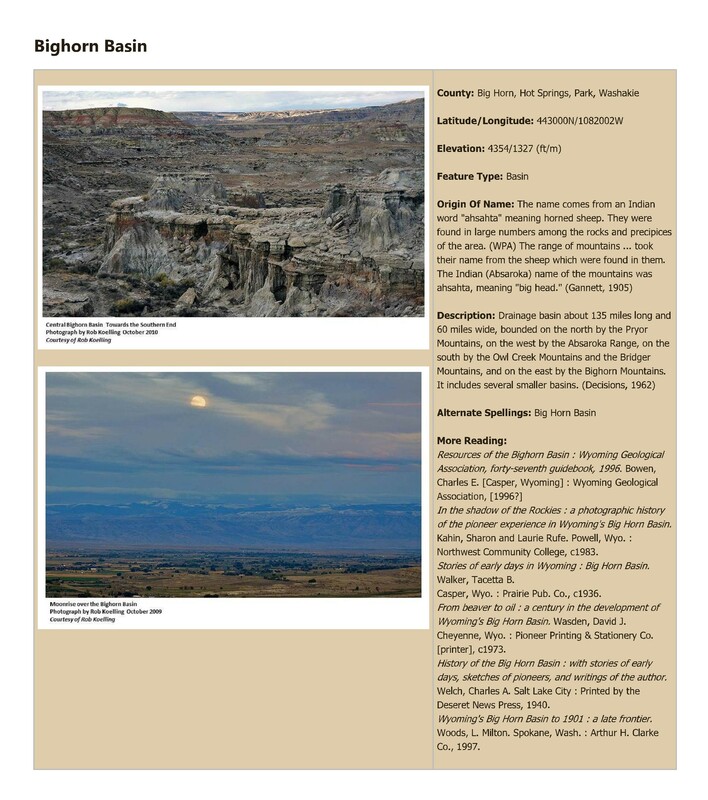 ]; In the shadow of the Rockies : a photographic history of the pioneer experience in Wyoming's Big Horn Basin. Kahin, Sharon and Laurie Rufe. Powell, Wyo. : Northwest Community College, c1983. ; Stories of early days in Wyoming : Big Horn Basin. Walker, Tacetta B.; Casper, Wyo. : Prairie Pub. Co., c1936. ; From beaver to oil : a century in the development of Wyoming's Big Horn Basin. Wasden, David J. Cheyenne, Wyo. : Pioneer Printing & Stationery Co. [printer], c1973. ; History of the Big Horn Basin : with stories of early days, sketches of pioneers, and writings of the author. Welch, Charles A. Salt Lake City : Printed by the Deseret News Press, 1940.; Wyoming's Big Horn Basin to 1901 : a late frontier. Woods, L. Milton. Spokane, Wash. : Arthur H. Clarke Co., 1997.